My youngest daughter is a huge Animal Jam fan. Recently, she stumbled across Sketch Jam, where an artist demonstrates how to draw some of the animals featured in the interactive Animal Jam world. 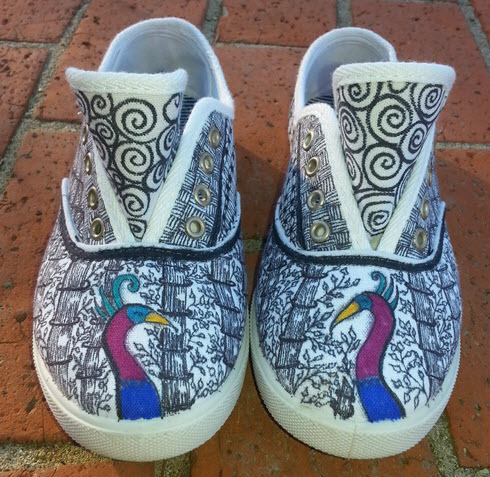 My sweet youngest child decided that she wanted to draw an animal on the toe section, and that I could Zentangle the remainder of the shoes. It was fun working with her on this project. Listening to her talk about which animal to draw, which patterns she wanted to surround her animal, and wondering how long it will take to complete, made me smile. Once she decided on Mira, the crane, she hustled her dad out to shop for shoes. She is proud of these shoes in which she took part in dreaming, planning, and creating. 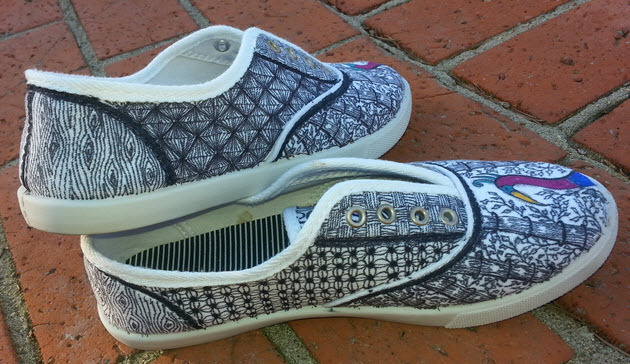 I can’t wait until we design our next pair! Very elegant! I hope she’ll have success at school. What a great idea! What eid you use for the drawings? Will it run when you wash it? I have personally seen these shoes,and they rock! Awesome hob ladies! I use Sharpie pens. They will eventually fade with washing, but that’s no big deal. Don’t use anything alcohol based with which to protect them, it messes with the ink, and blurs the design. I used Sharpie pens. They will fade after a bunch of washings. Color Catchers will absorb any running, but I haven’t experienced Sharpie pens running when applied to fabric in the past. Thanks for your comments and questions!